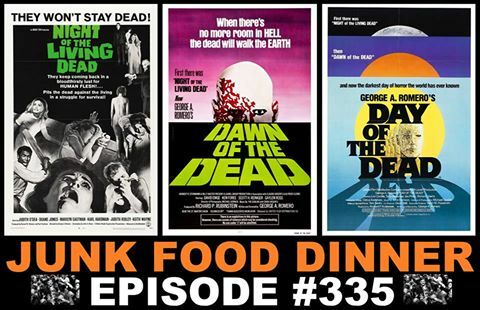 Schlocktober rolls along this week as we finally take on one of the most requested theme shows in JFD history. It's Living Dead week! First, corpses walk the earth searching for the flesh of the living in George Romero's "Night of the Living Dead" from 1968. Next, survivors make a fort out of a shopping mall in 1978's "Dawn of the Dead." Finally, the last remaining survivors search for a cure, while trying not to kill each other in "Day of the Dead." All this plus Nerd News, Godzilla Chat, Parker apologizes deeply, Sean's grampa views, Halloween movie-going Chat, Voicemails, Junkmails, Nerd News, DVDs and so much more! Also, if you like the show, please take a minute and subscribe and/or comment on us on iTunes, Stitcher, Blubrry or Podfeed.net. Check us out on Facebook and Twitter! We'll be your final girl in a horror fan-art painting for your love and support.